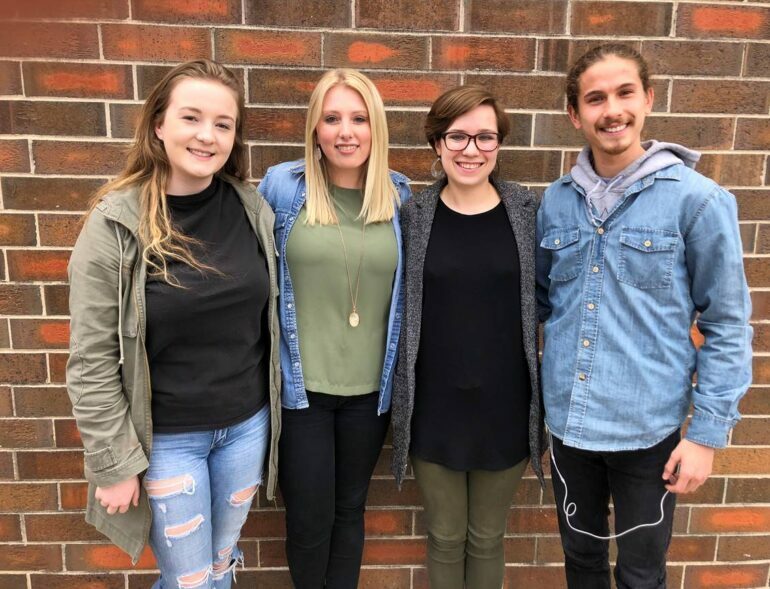 After competing in one competition, another challenge awaits four students from the USD’s music department as they advance to the online screening stage of the National Association of Teachers of Singing (NATS) auditions. Eldon Warner, Abby Beach, Kaitlin Pearson and Bailey Quade will represent the Northcentral region in their respective categories this coming month. The competition, which is divided into classical and musical theatre, advance their top five contestants in each category to the nationals. Categories are also defined by gender, age and the number of semesters the contestant have studied applied voice. Competition for Gesteland sits somewhere between creating performers and real-world experience. As an advisor and voice teacher, she always looks forward to preparing her students for the best performance. “It has been my pleasure and privilege to help these singers prepare for the regional competition in terms of selecting repertoire and instructing them so that they are well-prepared vocally, musically and dramatically to give their best possible performances,” Gesteland said. Abby Beach, a junior music education major, placed third in Upper College Musical Theatre Women. “My mom always said I was singing before I was talking,” Beach said. Beach said that their advancement in the competition portrayed the strength of the music department. With the foresight of being a music teacher, Beach appreciates feedback because it gives her precedents for the future. Bailey Quade, a junior vocal performance major, placed fourth in Third Year College Women. Quade said she was inspired to apply for the competition by her professor. “My professor asked me if I wanted to do it and I said okay…with my accompanist, we recorded the videos as many as we needed to and then I picked the best videos and sent them in,” Quade said. Quade who qualified for the junior women classical division said learning from corrections and re-recording were essentials for the next competition stage. Growing to be a music performer, Quade is still a student. Aware of the benefit, Quade is assured that this experience will be beneficial to her resume. “It’s really exciting because I am a performance major so like competitions really look good on your resume, especially a national one,” Quade said. Eldon Warner, a senior music education and vocal performance double major, placed first in Third Year College Men and first in Upper College Musical Theatre Men. Warner said participating in this competition will connect him to others in the music field. “It will expose me to many other singers and performers from all around the country who are of similar age to me, giving me the opportunity to perform in front of people who I might be very familiar with,” Warner said. Regardless of the result, Warner hopes to continually grow. Kaitlin Pearson won first place in the Advanced College Women category. Pearson, a second-year graduate student and masters in vocal performance, said vocal music makes her expressive through poetry and a variety of languages in a singular way. “I see music as a form of communication. It helps individuals make connections with each other and with their own emotions,” Pearson said. Gesteland and her students will be headed to St. Olaf College in Northfield, Minn. for the semifinal and final rounds of the national auditions if they advance from the online screening stage next month. The event will take place on June 27 and 28.